Too few products come with exploration-oriented maps (as opposed to something like a grid map for use as a battle map) that can be shared directly with all players. For example, consider this beautiful map by Mr. Logos. The under/over dotted line style gives away information that explorers should not know. Added work is needed to create a version of the map that can be revealed directly to players. I do not mean to single out Dyson; this was just the map that prompted these thoughts this morning. Other traditional referee-only features such as secret door annotations have the same issue. If the map itself is a work of art filled with nuance and detail, it seems like a shame for it to be seen only by the referee in a play context. While I probably notice this more now that I often share maps with fog of war reveal on hangout games, it could be relevant to in-person play as well, since you can cover up parts and use it as a visual aid. If it really is just for the referee’s eyes, the functionalist in me might even prefer something more schematic and less polished. Honestly I am not sure exactly where I am going with this. Do I think that all modules ever should be done in the most convenient form for me personally? No. Do I think that all modules ever should put more effort into game aids? Well, it would be nice, but there are resource constraints so again probably not. However, it is worth considering the way maps function as game tools. There are still many opportunities for improving the usability and format of modular content. This entry was posted in Uncategorized and tagged technique on December 5, 2014 by Necropraxis. I find the idea of genre emulation in RPGs inherently boring. The thing that excites me most about RPGs, as a medium, is that the possibilities are wide open. You are not constrained by diffident principles such as Chekhov’s Gun or other devices of dramatic progression and resolution. This is not to say that genres as descriptive categories have no value. In fact, I often describe games in terms of certain setting and genre characteristics, because that helps align player tastes and develops initial buy-in. Accepting that this is a starting point, not a constraint, opens up the possibilities of genre shift as a game progresses, which is another thing that other forms of media do poorly. Attentive players (and remember the referee is a player too), cognizant of each others’ feedback, can drift a game in one direction or another. This requires some degree of sensitivity and attention, but then so does all social activity. Such drift keeps a campaign interesting and fresh, where serial fiction could (and often does) stagnate. Since this is the Internet, I must acknowledge explicitly what should go without saying, that of course others need not share my preferences in this matter. But for me, I feel as if the unique potential of tabletop RPGs is sidelined by mechanisms which force only genre appropriate outcomes. I thrill to the possibility of an Independence Day where the aliens are triumphant, or a King Lear where everybody does not die. That is a big part of what “play to find out what happens” means. Below is quoted from Apocalypse World, pages 108 & 109. Play to find out: there’s a certain discipline you need in order to MC Apocalypse World. You have to commit yourself to the game’s fiction’s own internal logic and causality, driven by the players’ characters. You have to open yourself to caring what happens, but when it comes time to say what happens, you have to set what you hope for aside. The reward for MCing, for this kind of GMing, comes with the discipline. When you find something you genuinely care about — a question about what will happen that you genuinely want to find out — letting the game’s fiction decide it is uniquely satisfying. This entry was posted in Uncategorized on December 2, 2014 by Necropraxis. Following is the background I put together for a historical situating of Deep Carbon Observatory which I am running in person. One session down so far. The year is 1713 and the War of the Spanish Succession was just settled by the Treaty of Utrecht. 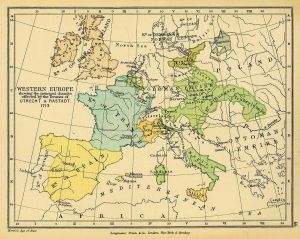 Great Britain, Portugal, the Dutch, and others successfully prevented France from consolidating a hold over Spain. The Faerie courts (unbeknownst to most common folk) meddled throughout the process, but seem to have vanished, not sending delegations to the final treaty negotiations. The Unseelie Twilight Prince had been seen as friendly to the British while the Seelie Summer Queen threw her lot behind the French. At the same time, strange Swiss machines were surfacing on battlefields and in other locations. British intelligence has tracked Swiss supply to the remote Lock River valley in the Low Countries. However, in the market supply of these Swiss devices seems to have ceased, and British spies report that the valley has flooded. A group of infamous adventurers called The Crows, previously in the employ of France but now disavowed, have already been reported in the area. You are part of a privateer expedition financed by the British Crown. Your primary objective is to investigate the flood to find out if something has happened to the supply of materials used by the Swiss machinists, who had a relationship with the British. The secondary objective is to kill or (preferably) capture The Crows. As per standard privateering arrangements, all treasure or valuables discovered may be kept as spoils. Machines and armaments are to be kept out of the hands of the French Dynasts at all costs lest the fist of Tyranny descent upon the continent. 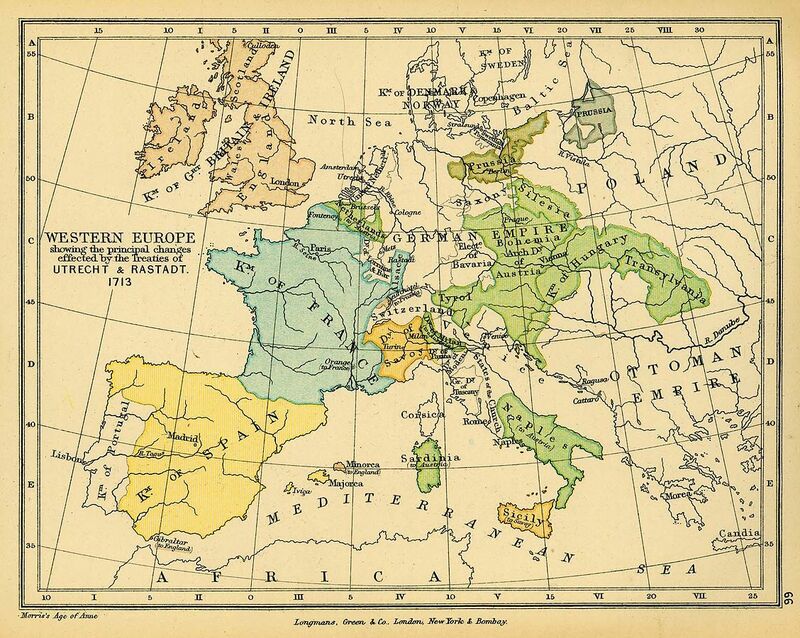 You need not be British, but if you are not you are most likely mercenaries included in the continental expedition. PCs begin at level 3. Increased funds for characters starting above level one is given on page 8 of Rules & Magic. In addition, you will begin with a retainer/attendant, which is a zero level character. If your main character dies, you can either continue playing as this retainer, or make a new character at your option. Demi-human classes may be selected but should be re-skinned as humans (a halfling could be recast as a scout, and so forth). Magic-users are renamed Occultists and may be either members of the hermetic order or hedge magicians. There are also Diabolists, but these worshippers of The Adversary are not available as PCs. Clerics are renamed Rosicrucians and are members of an esoteric society dedicated to furthering the machinations of Heaven. Non-occultist, non-fighter characters have an attack bonus of 1/2 level (round up). XP will be awarded for treasure recovered as standard, and also for the completion of objectives (capture/killing of The Crows, furthering the aims of your current British patrons, and so forth). No XP will be awarded for combat or killing in general, however. Reloading uses the firearms skill. This has a base of 1 in 6 for all characters, modified by attack bonus. To reload, spend a combat action, succeed on a dexterity check (1d20 less than or equal to score), and succeed on a firearms skill check. A firearms skill check may also be used to clean a fouled weapon (spending an exploration turn to make the check), or other firearms-related tasks. The overloaded encounter die will be used for timekeeping. This entry was posted in Uncategorized and tagged LotFP on October 20, 2014 by Necropraxis. Anomalous Subsurface Environment is a setting book that just happens to include a medium sized dungeon. It is a 100 page book. The dungeon part is pages 50 through 77, which is only 27% of the total page count. More than 40% is direct campaign background, 14% is new monsters, and so forth. Yet ASE1 is presented as a module (generally) and a mega-dungeon (specifically). It is my contention that ASE1 would have not been nearly as successful had it been released as The Land of One Thousand Towers campaign setting (with starter adventure included), and it would have done even worse as a cartoon science fantasy retro-clone (which it also easily could have been, with a few more classes and a chapter on combat rules). These are counterfactuals, so we can’t really know what would have happened, but examine for yourself what products have been successful. This is worth thinking about if you are making an RPG product. Consider what it is that people have already. How you position a product will guide people toward an evaluation yardstick. If you release something as a mega-dungeon, it will be compared to Barrowmaze, Rappan Athuk, and ASE. If you release something as a bestiary, it will be compared to the Fiend Folio and Teratic Tome. If you release something as a ruleset, it will be compared to Labyrinth Lord, ACKS, and Lamentations of the Flame Princess. And so forth. Think about, for one final example, how successful LotFP likely would have been had it been released as the Early Modern Weird Horror Historical Campaign Setting (which is actually just a hop, skip, and jump away from what is currently in the Rules & Magic hardcover). A full new ruleset is probably the least effective way to present something given how saturated that particular market has become, unless you are specifically looking to appeal to the crowd that is interested in rules for rules’ sake (and in that case you really need to have new and interesting rules; an interesting setting is probably not enough). 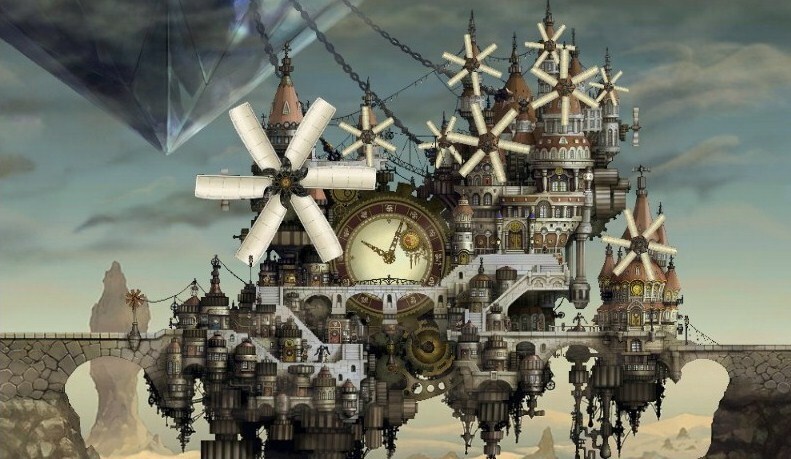 You can see this most clearly in the story games communities, where most of the successful products are innovative mechanically but often generic (or more kindly, archetypal) regarding atmosphere and setting. See, for example, Swords Without Master (wildly creative rules with an implied generic swords & sorcery setting) and Dungeon World (an unsurprising classic D&D setting variation on the elegant Apocalypse World engine). This entry was posted in Uncategorized on September 14, 2014 by Necropraxis. Material for tabletop RPGs is often grouped around specific types. For example: spells, monsters, classes, magic items, hexes, dungeons, NPCs, and so forth. Some of these types may be more complex than others. Thus, a published dungeon might include magic items and NPCs. Much of the utility of RPG content revolves around the effectiveness of presentation form. For example, is a monster better communicated as a page spread, with standardized stat section, picture, and extensive fictional ecology, or as a set of incomplete stats and a few sketched sentences? There may be benefits to both approaches. The online DIY scene has generated a number of innovative approaches in this area, such as the one page dungeon template (and resulting explosion of variations on that theme). Some entities have had more attention than others. Browsing blogs, it is hard not to stumble over new monsters especially, but also classes, spells and magic items. Dungeons require a bit more investment for creation, so there are fewer, but there are still many out there, especially with the one page dungeon contest driving content creation. Towns, however, despite being necessary content for many play styles and an excellent way of communicating setting, are rarely created and shared. By town here I mean any kind of somewhat sheltered and civilized area. PCs may primarily rest, recover, and restock in a town, but a town can also be a site of adventure. What makes a good town? The canals of Venice, the slums of Midgar in Final Fantasy 7, the clockwork town of Ancheim in Bravely Default, the treetop Inn of the Last Home in Dragonlance’s Solace, the Acropolis of Athens. A town does not have to be strange to be good, though that can be an easy way to add interest, but it has to be distinctive in some way. Places that feel real are memorable. Thinking generally, at least two or three notable features is probably a decent rule of thumb. Extending this to tabletop games in particular, I would also add several specific rules hooks as well, such as Uxa the town of apothecaries being the only place where universal antitoxins can be purchased. Such features give players a reason to care about where PCs are. If all towns are just inns and item shops, location does not matter, but if you can only learn time magic from the Chronomancers of Dundasmael, the town itself becomes adventure fuel in addition to supporting atmosphere and setting. As an experiment in creating such a location, included below is the town of Gorgonthorn (PDF version), a town perched on crags overlooking deep pools of water where giant crustaceans are harvested and the clerics wear masks. There are many ways that this presentation could still be improved. Gorgonthorn is still too wordy, and more setting could be presented through tables or rules than prose. Further, little attention has been paid to information design or layout directly. The town of Gorgonthorn is built on rocky scrub-filled highlands. It clings to a collection of perilous rocky outcroppings that are riddled with fissures hundreds of feet deep. Dark pools of frigid water lurk at the bottom of the fissures. Within these waters thrive a hardy form of spiny, cantankerous crustacean known as the vergomult which ranges in size from a single coin to a whole treasure chest. Harvesting the vergomults is dangerous and painstaking work, and often requires descending into the rocky crevasses, and braving the razor-sharp stones. Potential rewards are great for those that are skilled, however. Wooden walkways and narrow bridges are generally required to navigate between buildings, with the exception of the central market, which is the now-smoothed remnant of some ancient foundation. Gorgonthorn has no walls, but is defended by three tall, slightly crumbled watchtowers (originally built by some long dead conqueror), high ground, and numerous hazardous deadfalls (some artificial and lined with stakes) which are familiar to the local soldiery. One tower has a functional scorpion siege weapon mounted at the top, generally pointed toward the wilds. 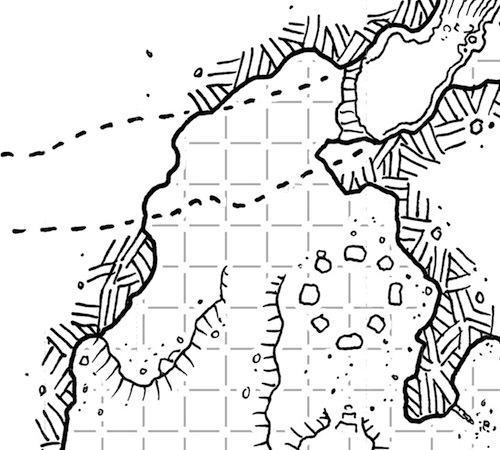 Positioned on the edge of ruined badlands, Gorgonthorn is also a common waypoint for adventurers and treasure hunters seeking glory and gold in untracked places. Sorcery in town is only permitted by members of the local Order of Mystery. Masks must be worn when in public on the weekly holy day (purchasable at the Sacrosanctum). The ancient right of trial by riddle is null and void. Social status is indicated by the extravagance and expense of holy day masks. Most minor items (torches, rations, daggers, rope, etc) can be purchased in quantity (within reason) at rulebook prices. See below for details about merchants and sellers. More significant items (such as suits of armor, heavy weapons, scrolls of magic spells, potions, and so forth) are limited in supply, only 1 or 2 of each specific kind of item available during any given game session. Items with limited supply should not be assumed to accumulate if PCs do not purchase them, as NPCs are customers as well. This is Gorgonthorn’s main inn and hostel. Provisions, rations, sustenance, and long-term room lets may be found here, along with Grand Vergomult, the house specialty dish. Basic room and board is 10 GP and will cover one person between adventuring excusions. This unnamed shop is marked by a pair of crossed wooden swords above the door. The proprietor is not a weapon smith, and relies mostly on commerce for supplies, though there are several craftspeople of vergomult chitin that make armor, shields, knives, and arrowheads out of that material. It is said that long ago the Order of Mystery spread across many lands and allowed philosophers to join in profitable congress. Many laypeople still believe that the rulers of civilized lands are little more than puppets of the magisters. Those more knowledgeable know that the Order has long been riven by jealousy and fear into feuding sects, and each guild house is essentially independent. The courtyard garden of the guild house is perpetually in bloom. The current Magister is the ageless and imposing sorceress Arvilia. The Sacrosanctum is a temple of law presided over by three high-ranking (but non-martial) clerics. These priests can craft the items listed below and turn undead as first level clerics, but otherwise have no special abilities. Several jewellers and porcelain sculptors are employed by the Sacrosanctum to craft holy day masks. Technically a rebel and apostate in the eyes of both the Magister and the Sacrosanctum, Tanser Noor has understandings with (or knowledge of dark secrets regarding) the significant town power holders, and thus is tolerated. Tanser’s small wooden house requires navigating a steep, rickety wooden stair (absent handrails) fifty feet down into one of Gorgonthorn’s many crevasses. There is a large bucket on a pulley operated mechanism that Tanser uses to bring supplies between his house and the town proper. He has a sweet tooth and will generally not be home unless a dessert of some type is placed in the bucket and lowered down prior to knocking on his door. Tanser has the ability to magically conceal his home (the chance of finding a secret door may be used if a full day is spent searching). He generally only does this when outsiders of high office or strange aspect visit Gorgonthorn. The town of Gorgonthorn has never had a proper grant of nobility, but it is ruled in practice by the Sheriff, who controls a small, independent soldiery that keeps order and protects the town. The sherif’s mansion is an imposing (but somewhat crude) stone building located across a wide, wooden bridge from the main market square. The Sheriff generally encourages adventurers (as long as they do not stay in town too long), as they bring money and can fulfill frontier bounties without needing to risk proper soldiery. Within this long, low clay brick building are interred the bones of Gorgonthorn’s dead. Proper interment costs 100 GP. The bones of the poor are cast upon the rocks after the flesh is burned away for purification. The ossuarium is operated by the priests from the Sacrosanctum. The building itself predates the establishment of Gorgonthorn. These cubic domiciles are crafted from clay bricks and shelter the less wealthy residents of Gorgonthorn. The clay bricks are stamped with good luck charms and signs of bounty before being fired. The residences have flat roofes and are often stacked, requiring a ladder for access. Up to two people may reside in a single room. This entry was posted in Uncategorized on September 8, 2014 by Necropraxis. Reading the 5E PHB, it seems to me like one of the differences between older (as in pre-WotC) D&D and newer D&D is that character abilities more often manifest as “specific beats general” rules. For example: monk class feature: Stillness of Mind: starting at 7th level, you can use your action to end one effect on yourself that is causing you to be charmed or frightened. This is, of course, explicitly discussed as a design principle (page 7), and I think the same language was in 4E as well, though I do not have those books conveniently available to check at the moment. There are some of these sorts of things in earlier D&D also, though not nearly as many. The paladin’s lay on hands ability is one such power, as is turn undead, and, perhaps, spell casting in general. But they were not nearly so prevalent, and the few classes that made heavy use of this sort of design (as did the AD&D monk and bard) felt different, and maybe even a bit off, like they didn’t fit the system quite as well as classes like the fighter, thief, or magic-user. Spells are the standard bundles of reality distortion available in earlier D&Ds, and while they do certainly increase PC play complexity (especially for those classes that need to make spell preparation decisions also), spells are a bit more cleanly separated from the underlying game engine, compared to the myriad discretionary class features present in the newer editions, and also are usually resources that must be spent, as opposed to options that may continually come into play. As a matter of game play, such “specific beats general” abilities are cognitively heavier than the choices necessary when playing most classes in older editions. They are part of a catalog that must be kept in active memory. You need to remember that you have Stillness of Mind available as an option when you need to end a charmed or frightened effect. Is this qualitatively different than the equipment inventories that develop with medium to high level characters in older D&D? I am not sure. In any case, equipment inventories are also an aspect of characters in newer D&Ds, so at the very least, when comparing complexities, the comparison is A compared to A + B.
I can’t help but think that the card design paradigm of Magic: The Gathering contributed to this trend. Even when considering alternative system approaches before the onset of WotC D&D, most games seem to focus less on little bundles of rules that accrete to PCs as they develop, and more on a fixed collection of measurements that improve (attack tables, skill ratings, and so forth). For example, the attributes, abilities, and backgrounds in Vampire: The Masquerade are mostly all on the character sheet for all characters to begin with. Characters develop vertically more than horizontally. This is not necessarily meant to be condemnatory, nor is it any kind of ironclad principle (as I am sure there are plenty of exceptions), but it does seem like drift in design sensibilities. This entry was posted in Uncategorized on August 25, 2014 by Necropraxis. Almost all of the Dark Souls rules are somewhat applicable to the tabletop context, but the magic systems seem especially so suited. There are three magic systems: pyromancy, miracle, and sorcery. There are “classes” associated with each, but any character can level into the various kinds of magic by increasing the appropriate stats. Each magic requires a characteristic implement be equipped in order to cast spells of the given type. Each interacts with PC stats in a slightly different way, and the number of overall spell slots, which must be divided between all types of magic, is controlled by the attunement stat. Spells must be prepared (“attuned”) at bonfires, which is the equivalent of downtime or recovery in D&D, and may only be used a limited number of times before resting again. Pyromancy is the simplest type of magic. There is some intimation that it is more primal and less sophisticated than sorcery. It is often associated with swamp dwellers, symbolic of exclusion and the primitive. There is a similarity here to the distinction WotC D&D makes between wizards (pseudo-academics) and sorcerers (wild talents, magic by lineage). Pyromancy power is not affected by any stats, other than the slots from attunement needed for spell preparation, and their power is dependent only upon the strength of the pyromancy flame used, which is the characteristic implement. A pyromancy flame can be upgraded independently by spending souls, which, remember, function like both GP and XP. Most pyromancy is simple attack magic, fireballs and so forth, though there are also a few defensive spells, such as iron flesh and flash sweat (which increases defense against fire damage). From a game perspective, pyromancy gives players a way to get access to magic damage by dumping souls into an upgraded pyromancy flame and a few pyromancies without needing to increase level at all, assuming a PC meets the (very low) attunement requirement to be able to prepare any spells at all. Sorceries are more academic, and higher precision. They often have intelligence prerequisites, and spell power is affected by intelligence. A character that wishes to be a competent sorcerer must dedicate a number of levels to the sorcery-oriented stats. The characteristic implement is the catalyst, often depicted as a wand or staff. Unlike pyromancy flames, or weapons, catalysts cannot be upgraded. You must find better ones. Though there are several attack sorceries (such as soul arrows, which are basic “magic blasts” that also have the useful function of tracking enemy movement to some degree), there are in addition many utility and misdirection spells, such as aural decoy (which lures enemies away by creating a sound elsewhere), fall control (as feather fall), and hidden body (basically, invisibility). I have been playing a warrior and have only dipped lightly into sorcery so far, so I do not have much direct experience with these spells beyond soul arrows, but for a combat-oriented action RPG, there are a surprisingly large number of spells that seem to enable non-combat creativity. Miracles are the province of the cleric, and are mostly, by default, as in D&D, defensive or restorative. However, the miracles a character has access to depends on which covenants are formed. For example, if you join the gravelord servant covenant, there are miracles that call giant phantom blades to attack your enemies. This is a fascinating system, reminiscent of “clerics of specific mythos” in 2E D&D, but much more dependent upon action during play. Further, a covenant comes with clear, objective factional duties and restrictions. I do not fully understand exactly how this affects gameplay, but what I have seen of the periphery makes the covenant system one of the most interesting aspects of Dark Souls design, and one that has been highly influential over my conception of clerics as servants of immortals in the world of The Final Castle. Beyond this contextual aspect, miracles work similarly to sorceries, requiring attunement at bonfires, and dependent upon the faith stat for power. The characteristic implement, which must be equipped to call a miracle, is the talisman. This system design engenders several different kinds of trade-off. First, there are the advancement decisions about which stats are increased during level up. While strictly speaking it is possible to grind souls and increase everything, in practice this is tedious, and further unnecessary to be successful*. If you are just playing the game to explore and overcome challenges, you will naturally need to choose between physical capability and the various kinds of magic. This mode is also more applicable to the tabletop context, where grinding dynamics are minimized or nonexistent. Second, there is the cost and availability of various spells. Third, when you set out from a bonfire, you must divide your available attunement slots between spells. If you have four slots, for example, two could be miracles and two could be sorceries. Fourth, and most importantly in terms of the gameplay experience, you must wield the appropriate implement to cast a given spell. While encumbrance rules do not prevent you from carrying everything with you (an aspect of the game I find somewhat strange), they do prevent you from equipping more than a few items, and switching between items that are not equipped during combat is asking for a quick death. In practice this means that you have a primary and secondary equipped item in each hand that is east to switch between. The left hand is usually occupied by a shield and either ranged weapon or tool (such as the skull lantern). This leaves the right hand for (likely) a melee weapon and magic implement. The final result of all of this design is that it is impractical to ready more than one kind of magic on a given excursion. Fifth, and finally, casting a spell has a more or less lengthy animation and thus requires a trade-off consideration in terms of when you start to cast a spell, as enemies may take advantage of that time or your vulnerability. * At least in single-player mode. If you are into PvP it is likely different. The fact that grinding souls might make a big difference in the viability of character power is part of the reason I have little interest in PvP. This entry was posted in Uncategorized and tagged cleric, Dark Souls, magic-user on July 31, 2014 by Necropraxis. Traditionally in Dungeons & Dragons, there is a relatively sharp divide between inherent character qualities and the main capabilities that interact with important game systems. If we were talking more abstractly about what makes up a person, one might see nature and nurture in this split, but that is not quite it, because there are many aspects of a character that would most properly be considered nurture (such as AD&D secondary skills) which have little impact on game capabilities outside of the occasional edge case. As you have probably already guessed by now if you have any experience with D&D, this division is realized by ability scores and character class. The former may have some influence on marginal effectiveness of the later (such as a dexterity bonus to missile attacks), but it would not be unreasonable to say that ability scores represent a characters raw potential whereas class represents something more about a character’s particular life experiences and training. A major benefits of this approach is that two characters of the same archetype can be differentiated without needing to resort to more complicated trait or skill systems. For example, traditional D&D rules support both charismatic, leader fighters and brutal, strong fighters in a way that gives mechanical weight to the distinction without undue complexity. This is possible because most important game capabilities are either located in class (attack bonus, weapon proficiency, spell casting, thief skills) or static across all potential character build options (such as the 1 in 6 search chance). In this older approach, ability scores are relatively static, baring supernatural augmentation. If a first edition fighter begins with 10 strength it is totally conceivable that the same fighter will still have 10 strength at 20th level, assuming the character manages to survive that long. Despite only being of average strength, this imaginary fighter will still be competent, because increasing combat effectiveness is tied mostly to class level. Another approach is to treat stats as more direct measures of game effectiveness rather than seeing them as a way to describe the totality of a fictional person. Third Edition takes a few steps in this direction with its regular (every fourth level) stat increase, though this is small enough that it can still be understood as minor fictional personal growth, staying within the “nature” conception of ability scores. Other games take this further, such as Green Ronin’s Dragon Age (which I have previously discussed in more detail), where each level an ability can be incremented and, for example, stealth is just a dexterity test, meaning that characters of any class can improve into that area. The recently released Fifth Edition D&D version 0.1 basic rules are closer to this second style. Very few bonuses are directly traceable to class. For example, there are no class-based attack bonuses. Instead, there is a general level-based “proficiency” bonus which applies to different things. Proficiency in something can be awarded by background, race, class, and presumably feats (though the details of feats will not be revealed until the publication of the Player’s Handbook). The proficiency bonus ranges from +2 to +6, and otherwise the ability score bonuses apply to all tasks. So, a fighter could gain proficiency in thieves’ tools (thus being able to apply the proficiency bonus). A wizard could get better at shooting bows by increasing dexterity during one of the regular chances to increase ability scores. These opportunities happen approximately every four levels, though it varies by class, but they grant a +2 or two +1s, making the improvement more impactful than how it is done in 3E. At first one might say that this is not all that different than the older approach. It’s just a few bonuses, right? If you actually look at the numbers though, the way things work out is that most characters, if the player cares even a little about mechanical effectiveness, will end up with 20s (which is the max) in the ability scores most important to the class. At this point, if you can assume that all melee fighters will end up with 20 strength and all wizards will end up with 20 intelligence, the ability score system is no longer attempting to describe the “nature” side of the equation. This is not a bad design decision, but I think it might be frustrating for players expecting something with a feel like 3d6 down the line. That set of random numbers, in addition to providing game bonuses, is also something like a personality profile. That use of ability scores has been marginalized, which may be part of the reason that other personality mechanics (ideals, bonds, flaws, inspiration, etc) were added. Dark Souls uses a similar scheme. Class in that game determines only initial stat values, starting equipment, and starting spells. It is possible to level a “warrior” character into, essentially, a sorcerer by improving attunement and intelligence scores. The system is elegant and easy to understand. It is probably slightly more flexible than is appropriate for a tabletop game, which will almost certainly involve multiple PCs cooperating. Dark Souls, however, being at heart a one player game, needs to support accessing different strategies through the same fictional avatar. Though there are some cooperative multi-player features, most of the game is not about a party of adventurers solving problems by working together. That said, the way the stats are improved, and what they affect within the game world, are almost directly appropriate to the tabletop context, and are interesting to compare the “increase ability scores” models that can be seen in Dragon Age and Fifth Edition D&D. For reference, the Dark Souls stats are vitality, attunement, endurance, strength, dexterity, resistance, intelligence, and faith. In The Final Castle, I have also settled on an approach where stats are more about game capabilities than complete representation. Like Dragon Age, the scores are much smaller, what would be probably recognized as the “modifier” in D&D terms, and each time a level is increased one is incremented. The basic array is described here (strength, dexterity, constitution, magic, perception, charisma), though the mechanics have changed somewhat. Starting values range from 0 to 3, with no possibility of negative modifiers, as with the original Gravity Sinister system, and the 3-18 number is no longer recorded, though it is used to determine initial values. I am also considering narrowing the scope even more for some of the abilities, to make it even clearer what is going on, such as replacing perception with aim. The current improving bonus from perception sits uncomfortably with the scale of the d6 skill rolls (once perception reaches +4, the basic skills such as search and listen become optimal, with only 16% chance of failure). This entry was posted in Uncategorized on July 7, 2014 by Necropraxis. As previously mentioned, I have been working on a system which is the evolution of my earlier Gravity Sinister work, also informed by my experience running OD&D over the past few years. This is coming to fruition as an integrated coupling of setting and rules. I am calling the project as a whole The Final Castle, after the fortress/dungeon which is the center of the games I am running with it. Here is the background summary, which is also the intro to the current Player’s Guide draft. This draft is actually a text-complete finished document that has already seen some play-testing but will need to see more before I decide on the best way to release it. Scion of the immortal Basmophael, the figure known only as the Harbinger claimed to herald the next phase of reality. The Harbinger moved inexorably across the known lands, unleashing monsters previously imprisoned in the dark places of the earth, and promising great power to those that would recognize the new dominion. The arrival of the Harbinger was always preceded by a fortress that would tear itself from the ground. Then, the legions would pour forth, destroying all defenders. If the settlement was not annihilated entirely, the leadership would be replaced with a loyal servant, and the fortress would wither, soon becoming little more than a looming husk. Then the cycle would be repeated elsewhere. The sempiternal courts took no action, assuming that they would be able to endure any human turmoil. The agents of Basmophael, however, infiltrated their hidden strongholds. Some surrendered and were corrupted. Others fought and were reduced to shadowy echoes of their former glory. Few remain. Using subterfuge, an alliance of champions entered the Harbinger’s castle by means now unknown. With great hubris, the Harbinger had taken insufficient precautions against such a daring attack, and was subdued, though not destroyed, as destruction was beyond mortal power. The Harbinger’s armor was found to be a locus of Basmophael’s power, though it too was impervious. Unable to destroy the panoply, pieces of the armor were divided among the champions for safekeeping, but the Harbinger’s will was underestimated. Many of the panoply bearers that escaped have since been driven mad, compelled to return with the armor to the Harbinger’s fortress. Thus, the divided panoply remains held by occupants within the castle, each scheming to acquire the entire suit, as it is said to allow full control of the castle’s terrible armaments. Unlike previous castles, the final castle has not withered, though neither has it belched forth new armies since the armor was disassembled. Rumors say that the Harbinger’s generals and creatures have fallen to internecine struggle. The final castle broods darkly over surrounding battlefields, which seem to be slowly expanding, inch by inch, day by day, despite the absence of any true fighting since the daring infiltration that seemingly ended the Harbinger’s war. This entry was posted in Uncategorized and tagged The Final Castle on July 3, 2014 by Necropraxis.